From portraits to semi-abstracts and sculptures, and now back to portraits in this particular exhibition, Ramesh Terdal has followed his instincts rather than trends. A gold medallist in graduation (BFA) he did his masters in painting from Karnataka Chitrakala Parishath. Despite pursuing painting for more than ten years, the Bangalore based artist is rather underrated despite his talent and skill. 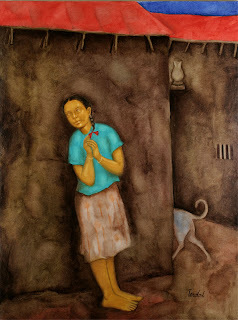 Ramesh’s works are quiet and introspective - the portraits of children are highly expressive and full of innocence. Rich textures and a rustic appeal characterize his works. Vivid browns and rusts set the backdrop to create an earthy feel since, most of his paintings are inspired by rural scenarios. There are subtle variations in this present set of twenty-five paintings compared to his earlier figurative works – for instance some of the works are in much darker hues, and the eyes and the faces lack definition. Outlines and details are less and have been replaced by patches of dark colors; also there is an enhanced air of mystery and intensity to the portraits. Through it all the children’s faces reflect their various emotions of happiness, sorrow, playfulness and shyness. The play of light and shadow creates interesting effects. One of the works that belongs to the series “Celebration’ is a part of the collection that will be exhibited in London shortly. Despite a dark and intense palette the work is much more contemporary than the portrait series. The exhibition is on till March 9 at Lakshana Art Gallery, Bangalore.